No more than 18 hours before a scheduled court hearing, the FBI is now saying it doesn’t need any help from Apple to get into San Bernardino shooter Syed Rizwan Farook’s iPhone 5c. So, as of Monday night, the hearing has been called off, and the February 16 court order that started Apple’s battle with the FBI has been stayed. Early Monday night, Apple held a conference call with reporters to discuss the latest development, which surprised Apple as much as everyone else who’s been following the case. After all, the FBI and its director, James Comey, have insisted multiple times that only Apple has the expertise to break into this phone. This premise was the linchpin to the FBI’s request for Apple to write “GovtOS,” a version of iOS that would run on Farook’s phone and remove the Erase Data feature that would wipe the phone after 10 incorrect guesses at his passcode. In fact, warrants issued under the All Writs Act need to pass some tests (established by the courts in prior cases), and one of them is whether such a warrant is “necessary and appropriate.” If the FBI is now claiming it doesn’t need Apple’s help, it’s suddenly uncertain whether that court order would pass the “necessary” test. As there is presently uncertainty surrounding the government’s need for Apple’s assistance, the court’s February 16, 2016 Order Compelling Apple, Inc. to Assist Agents in Search, in case number ED 15–451-M, is hereby stayed, pending further submissions in this case. It’s not over yet, though. The stay also gives the government a deadline of April 5 “to file a status report.” If the FBI is indeed able to get into Farook’s phone without destroying its data, the government might choose to drop the issue altogether. Of course, if the government is successful in accessing Farook’s phone, then Apple will be left with unanswered questions of its own—the first being, How exactly did the FBI get inside the phone? “This was a bolt from the blue from them,” said Apple’s lawyers. Indeed, the company says it had no idea the FBI was still attempting to break the iPhone’s encryption on its own. 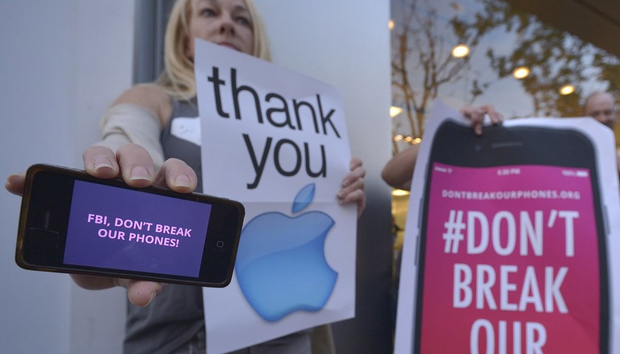 Right now, Apple doesn’t know how—or even if—the phone was breached. But they’re curious. Apple’s lawyers said that if the government decides it wants to pursue the case, the company would want to find out who the government consulted to get into the phone without Apple’s assistance, and what “method” they were offered. If the government drops the case, Apple still hopes the FBI would share what it learned about iOS’s vulnerabilities. So for the time being, the case is on hold. Judge Pym wants a status update from the government by April 5. The stay is embedded below.